cPanel is a Linux-based web host program that serves as a control panel and offers an interface, complete with tools for automation, allowing the process of hosting a website to be simplified. cPanel is comprised of three tiers having sections for administrators, resellers and end-users, all of whom can control different parts of the website. It offers a wide variety of application-based supports, including for PHP, Apache and MySQL. It is important to note though, that once it is installed, it can be difficult to remove, and really the only way to achieve this successfully is by reformatting the server. The program was originally designed for Speed Hosting, now collapsed, and was authored by John Nick Koston, who originally had a stake in the aforementioned company. Soon after the initial company’s closure, Webking began to use cPanel and provided this service to a select group of clients. The third iteration of cPanel was eventually released in 1999, complete with an improved interface, automatic upgrades and a Web Host Manager. cPanel along with WHM are different servers that hold a varying number of Perl environments within their application. Different Perl modules can be used within these environments, though there may be need of some modifications in order to ensure smooth operation and run times. Current versions of cPanel the server’s Perl binary. The Perl modules allow the programmer to add extra levels of functionality to the cPanel. There are a number of different modules that are included, but these will depend on the different versions of cPanel that are available. Perl has many uses within cPanel. One such function is the LiveAPI Perl Module. This creates an environment for Perl applications, and using this in conjunction with cPanel one can create a wide variety of integrated cPanel and Perl applications. There is also a cPanel Licensing Perl module. This is operated through a Manage2 API, which creates an automated system through the cPanel license and helps in the management of procedures. Perl Hook Action Code allows the program to activate applications when cPanel is in action. These action codes can be created within a specific made Perl module or even as a separate executable script. 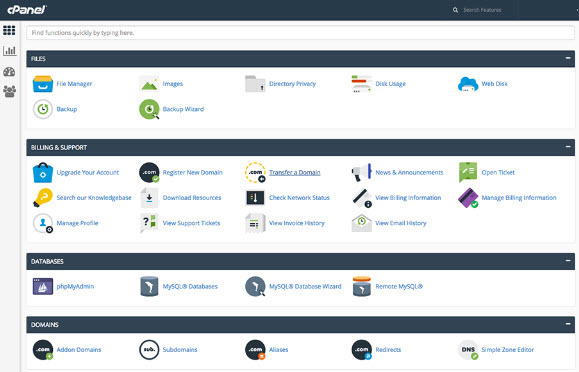 cPanel offers an accessible way to simply and easily manage and host a website. Its ability to integrate with a wide number of different programs makes it a popular choice for many. There are also a large number of add-ons that exist, allowing further applications to be combined with the basic set up. These include WordPress, MagicSpam, Moodle, SMF and many more.